Kathamba satham (கதம்ப சாதம்) is a tamarind based mixed rice preparation that is often made with country vegetables (நாட்டு காய்கறிகள்). It is a wholesome meal by itself, and can be served with pachadi and appalam. Kadamba satham is one of the famous recipes of Iyengar cuisine. 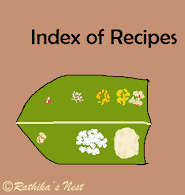 * Usually country vegetables such as ash gourd (white pumpkin), yellow pumpkin, brinjal, drumstick, plantain, cluster beans, broad beans and chow-chow are used for making kathamba satham. However, you may also use carrot, French beans and potato. Cut the vegetables into 1” long pieces. Method: Wash rice and toor dhal separately. Add 2 tumblers (400ml) of water to rice and 1½ tumbler (300ml) of water to dhal. Cook rice and dhal in separate containers in a pressure cooker for 7 minutes or 7 whistles. Soak tamarind in one tumbler or 200ml of warm water. Later squeeze and extract tamarind juice by adding 200ml (one tumbler) water. Keep aside. Heat 1 teaspoon of oil in a kadai and fry red chillies, coriander seeds, Bengal gram dhal and methi seeds till the dhal turns golden brown in color. Add asafoetida and switch off the fire. Once cool, grind the fried ingredients with coconut and required water into a fine paste. Mix this paste in tamarind juice and keep aside. Heat the 1 teaspoon of oil in the kadai, add the cut vegetables and sauté for a minute. Then add the required salt and green chilles. Cover and cook on a low flame till the vegetables are done. Add the tamarind juice mixture, jaggery and bring it to boil. Simmer for 2 minutes. Mash the cooked toor dhal with a hand blender very well and add to the boiling mixture. Mix well and allow it to boil for 2 more minutes. Meanwhile, add ghee and sesame oil to the cooked rice and mix well with a rice spoon. Add the rice and required salt to the boiling mixture and blend very well. Simmer for 2 minutes and switch off the fire. Heat the remaining oil in a tadka pan or spice pan (தாளிக்கிற கரண்டி), add mustard seeds and when they start to sputter switch of the fire. Add tempering to the kathamba satham and garnish with curry leaves. Serve hot with pachadi and appalam/vadam.